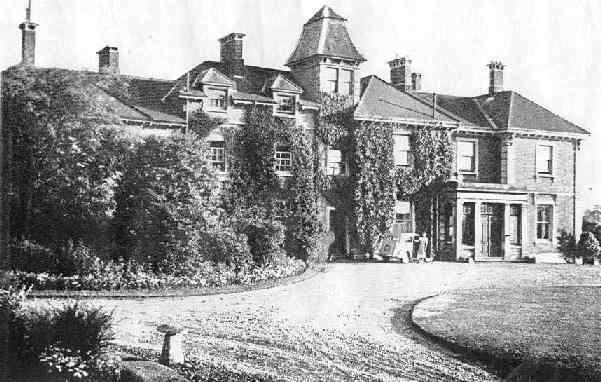 Although the Sturges family lived at Barkham Square for many years, they had a long involvement with Arborfield, not least because Aline Rhoda Sturges married John Hayes Simonds and they inherited the Newlands estate after John's father died in 1929. 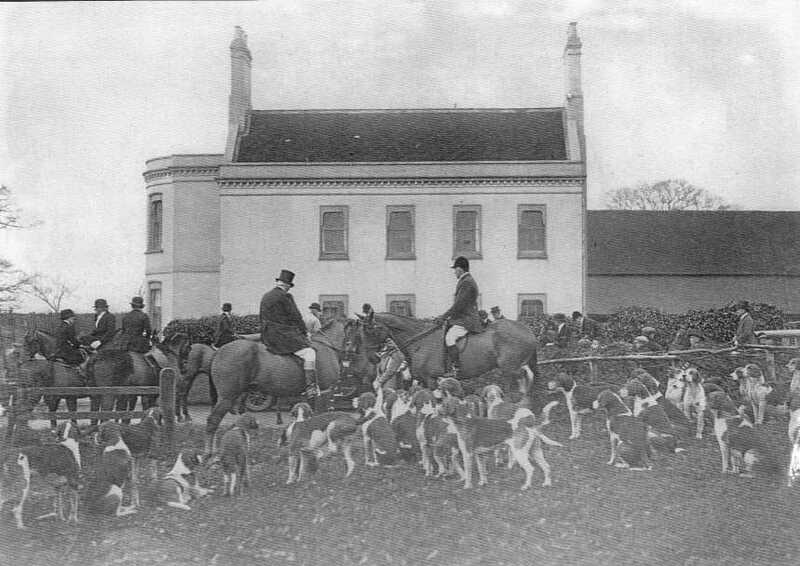 Both families were keen members of the Garth Hunt, which often met at either Newlands or at Barkham Square (seen right). Indeed, Mr. E. M. Sturges was honoured by the Garth Hunt for his 'long and valuable services' at a dinner on 6th November 1922, as reported in detail in the 'Reading Mercury' of 11th November. Edward Sturges was remembered for much more than the Garth Hunt, because he chaired Wokingham Rural District Council for around a third of a century and was still in office when he died. The R.D.C. had its offices at Shute End in Wokingham, although its jurisdiction was outside the borders of the town. 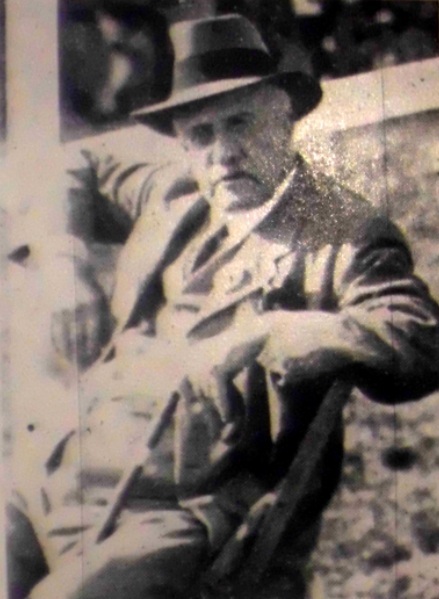 He was instrumental in getting a good water supply for Arborfield and Barkham from a bore-hole beneath Arborfield Hall , which was implemented in 1933. 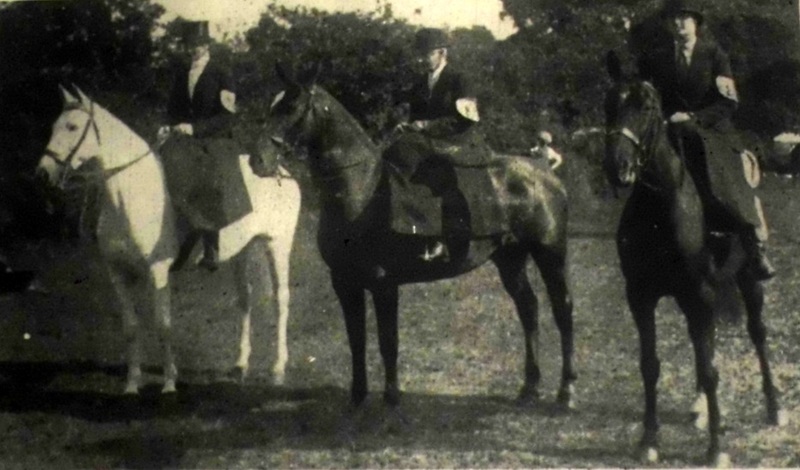 The 'Reading Mercury' often carried news items on members of the Sturges family, and the following photograph was published on 7th October 1933, captioned "Three generations in the riding classes at Wokingham Show [held at Shinfield Grange]. Mrs. E. M. Sturges (centre), Mrs. J. H. Simonds (right) and Miss E. Simonds (left)." The newspaper celebrated Mr. Sturges' re-election as chairman of W.R.D.C. at the beginning of May 1934, only to have to report his death and funeral later that month. The family name lives on at Sturges Road in Wokingham, named after Canon Edward Sturges, Edward Murray Sturges' father, who had been Rector of Wokingham from 1875 to 1904. MR. E. M. STURGES' RECORD. 31 Years Chairman of Wokingham R.D.C. Mr. E. M. Sturges entered on his 32nd year of office as chairman of the Wokingham Rural District Council on Tuesday, when he was again re-elected to the office. Mr. Sturges was first appointed in May, 1903, and he has been a member of the council for 39 years. The re-election of Mr. Sturges was proposed by Col. C. D. Burnell and seconded by Mrs. Jarvis. Thanking the members, Mr. Sturges referred to the work of the Council, and he thought their water schemes were going along fairly well, although there had been trouble [There had been a prolonged drought at the beginning of 1934]. Having regard to the enormous increase in building it would be necessary shortly to consider the question of drainage. What was going to happen he did not know, for the expense of such a scheme were enormous. Meanwhile they were doing their best with the vacuum tanks – they were no longer called “Lavender Jims” - they were beautiful, sweet-smelling things. They were losing the services of Mr. C. Aldridge (Surveyor of Buildings), said Mr. Sturges, and they wished him many happy years in his retirement. Anyone who visited their district could not help being struck by their picturesque council cottages, and credit for this was due to Mr. Aldridge. In conclusion, he welcomed the new member, Mr. F. W. Byles. Mr. George Ford was unanimously re-elected vice-chairman on the proposition of Mr. J. Hautenville Cope, and Mr. Sturges observed that he had held this office for 12 years. Mr. Ford referred to the enormous increase in receipts from Road Fund licences, and said he felt that they were not having a fair deal from the Government in this matter. He had asked the representative to the County Councils' Association to take the matter up and urge that they might receive more from the fund. The grant to Berkshire had been decreased by some £3,000, and while the County Council paid out the additional money the R.D.C.s had to find it. If they had a larger share from the money received for Road Fund licences it would help their local rates considerably. Mr. Sturges referred to the question of the Kingsmere property, and said that whatever happened, they had agreed they would not entertain the purchase of the lake [In Spring 1934, the lake was totally dry, as shown in a photograph in the 'Mercury' on June 16th]. Upon the proposition of Mr. Ford, seconded by the chairman, the council passed a resolution expressing the hope that facilities for obtaining electric power in the district would be provided as soon as possible, as it was urgently needed. They also referred to the need for cheaper electricity. DEATH OF MR. E. M. STURGES. A Man With Many Friends. Over 30 Years Chairman of Wokingham R.D.C. We deeply regret to record the death of Mr. Edward Murray Sturges, which occurred on Tuesday at his home, Barkham Square, Barkham, at the age of 74. Although Mr. Sturges had not been in the best of health of late, his passing came somewhat as a shock to his countless friends, for he was only taken ill on Friday last week. Mr. Sturges was one of the most popular men in East Berks, and he was particularly well known amongst members of the farming community. His jovial personality gained him friends wherever he went, but at the same time he was never afraid to express his opinion, and his services were therefore of particular value in the public work in which he played so great a part. In all matters he was fair and just, and his death has left a gap which it will be hard to fill. The eldest son of the late Canon Sturges, Rector of Wokingham, Mr. Sturges was educated at Winchester and Pembroke College, Cambridge, being captain of the football and cricket teams at the latter. After taking his degree he went, in 1883, to Australia as A.D.C. to Sir Henry Loch, afterwards Lord Loch, who was then Governor of Victoria . On his return to England, he studied and qualified as a barrister-at-law at the Inner Temple, but he never practised. From 1891-96 he lived at Stanlake Park, and then he moved to The Coppice, Lower Earley. In 1904 he moved to Barkham Square as tenant farmer to Mr. Arthur Walter , and later he purchased the house and farm. NEARLY 40 YEARS ON R.D.C. Ever since its formation 39 years ago, Mr. Sturges has been a member of the Wokingham Rural District Council , on which he had rendered invaluable service. A few months after its formation he was elected vice-chairman, and he acted in this capacity until, eight years later, he was elected chairman. This office was held up to the time of his death – a period of 31 years – a record which it would be difficult to better. His chief interests in connection with local government were the questions of water supplies and drainage, and the inhabitants on the R.D.C. 's area have much to thank him for in these matters. He was always anxious that wherever possible people should be provided with a plentiful supply of pure water, and that there should be drainage facilities. A scheme for supplying water to Wargrave and Twyford was put into operation between 1895 and 1899, followed by the Wargrave drainage scheme. Water supplies for Sonning and Shinfield and vast improvements to the old systems were carried through under his guidance as well as dealing with problems concerning drainage. It was only last year that he opened a new pumping station at Arborfield and saw another of his ambitions fulfilled. By virtue of his office as chairman of the R.D.C., Mr. Sturges was a Justice of the Peace for the Wokingham Petty Sessional Division , a work for which he was particularly fitted. On the Bench Mr. Sturges displayed the same fairness as he did in presiding over the meetings of the various bodies with which he was connected. He was also a keen worker on the now defunct Wokingham Board of Guardians , having been appointed a member of this body in 1895, and being elected vice-chairman the same year. Ten years later he became chairman, and he remained in this office until the Board was disbanded in 1930. 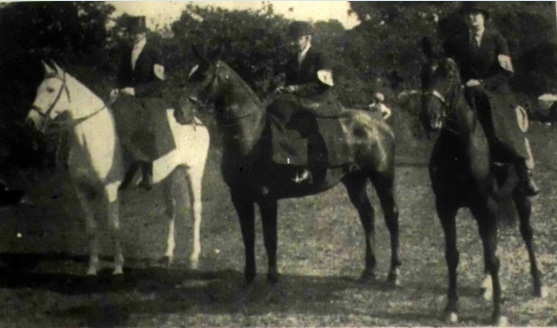 In 1902 Mr. Sturges became assistant secretary of the Garth Hunt, and two years later he arranged the first point-to-point race meeting, which has become one of the most popular events of its kind in the district. From 1910 to 1922 he was secretary of the Hunt, having succeeded the late Mr. John Simonds. When he retired the members presented him with a portrait of himself in hunting dress, painted by Mr. Cecil Aldin . At the time of his death Mr. Sturges was president of the Garth Hunt Club , and when he had to give up riding to hounds he followed them in his motor-car. In this manner he attended a number of meets during the past season. The growth of the Wokingham Agricultral Association was due in great measure to Mr. Sturges' efforts, for, for a great many years he acted as hon. secretary. Later he became chairman and a vice-president. It was a coincidence that last year this Association's show, with which Mr. Sturges was so closely identified for over 40 years, was held on the day that he was celebrating his birthday. When the Royal Show came to Reading in July, 1926, he was a member of the executive and local committees, while in 1930 he was on the council of the Royal Counties Agricultural Association on the occasion of its visit to the town. Mr. Sturges was also associated with a number of other organisations, including the Berkshire County Cricket Club and the Newlands, Arborfield and Barkham branch of the British Legion , of which he was president. In 1887 Mr. Sturges married Eliza, daughter of Mr. and Mrs. R. Grice, of Australia, who survives him. His elder son, Mr. E. E. Sturges, was killed during the Great War while serving with the King's Own Yorkshire Light Infantry. His surviving son is Major R. G. Sturges, of the Royal Marines, now stationed at deal, and his twin sister is the wife of Mr. John Simonds, of Newlands, Arborfield. Mr. Sturges' brother is Judge Sturges, K.C. , who is Recorder of Windsor. The funeral will take place at Barkham Church to-day (Saturday) at 3 p.m. THE LATE MR. E. M. STURGES. The funeral of Mr. E. M. Sturges, J.P., of Barkham Square, chairman of the Wokingham Rural District Council, whose death at the age of 74, was reported last week, took place at Barkham Church on Saturday amidst every sign of respect. The little church was crowded, and many were unable to gain admission, having to stand in the churchyard throughout the service. The Rev. J. B. Barker (Rector of Stratfieldsaye) officiated, assisted by the rector (the Rev. G. Gregory). Mr. A. E. Manning was at the organ, and the choir were in attendance. The hymn, “Fight the good fight”, was sung in church, and Psalm 23 was chanted, while “Abide with me” was sung at the grave-side. The coffin was taken into church during the morning, and laid at the end of the chancel. The mourners were Mrs. Sturges (widow), Major R. G. Sturges (son), Mr. and Mrs. J. H. Simonds (son-in-law and daughter), and Miss Elizabeth Simonds (grand-daughter). Also present were Judge Sturges, K.C. 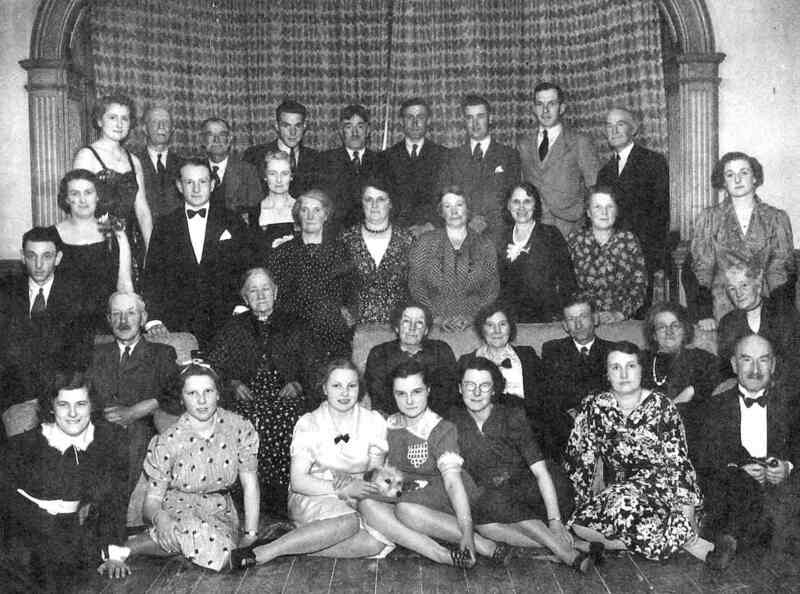 (brother), Canon and Mrs. E. J. Norris (brother-in-law and sister), Miss Norris (niece), Miss E. M. Sturges (sister), Mrs. Last (sister), Mr. William Sturges (brother), Miss Ethel Sturges (cousin), Mr. Simon Sturges (nephew), Mrs. Charles Barnett and Mrs. Norman Gwynn (nieces), Mr. Victor Hill and Mr. J. B. Hill (nephews), and Mr. Oliver Barnett (great-nephew). Among others present at the church were Mr. and Mrs. H. E. A. Wiggett, Major and Mrs. M. H. Simonds, Mr. Hugh Godsal, Mr. John Godsal, the Marquis of Downshire, Lord Dorchester, Lieut.-Colonel the Hon. Sir Eustace Fiennes, Major Michael Wallington (representing Isabel Lady St. John Mildmay), Captain B. Marley, the Mayor of Wokingham (the Rev. C. Mansfield), and Councillor C. Goddard (Wokingham Town Council), Mr. Charles H. Palmer (representing the South Berks Hunt), Mr. C. Eric Palmer, Mr. R. H. R. Palmer (joint Master, Garth Hunt) and Mrs. Palmer, Colonel F. G. Barker, Mr. Guy Hargreaves, Mr. Oliver Dixon, Major E. W. Shackle (Master, Berks and Bucks Farmers' Staghounds), Mr. Vivian Simonds (secretary, Garth Hunt), Major and Mrs. Allfrey, Miss Edith Allfrey, Mr. and Mrs. Gerald Simonds, Miss Pamela Simonds, Mr. F. A. Simonds, Mr. J. Friedlander, Commander Tweedy, Mr. Guthrie Allsebrook, Mr. C. H. Illingworth (Vine Hunt), Major Graham Rickman, Mrs. Scott Murray, Major Tanner, Captain and Mrs. Edwards, Major and Mrs. Rushbrooke, the Misses Tanqueray, Major H. W. K. Wait, Captain Wait, Captain Washington, Mr. Thomas Haig, Major G. D. Edwards(president and hon. secretary), and Mr. W. P. Colebrook (vice-chairman, Wokingham and District Agricultural Association), Mr. G. P. Male; the following members of the Wokingham R.D.C. : Mr. George Ford (vice-chairman), [and many others; followed by a very long list of floral tributes]. On Tuesday reference to the death of Mr. E. M. Sturges were made at the Wokingham County Bench, of which he was a member, and the meeting of the Wokingham Rural District Council, of which he was chairman. At the Bench the chairman (Colonel F. G. Barker) said Mr. Sturges was an ex-officio member of the Bench as a result of his being chairman of the Wokingham R.D.C. At the time of his death he had been a member of the Bench longer than any of them present, and he was about the last magistrate who had sat at the Town Hall before that court was built. For the last few years he had been unable to attend very regularly owing to ill-health and the fact that the R.D.C. met on the same day as the Bench. He was well up in all matters connected with the county and country life of the district, with which so many of the cases were connected. The Bench would like to record their appreciation of the work he has done, and their regret at his passing. Dr. Paterson, on behalf of the officers, said they would like to be associated with Mr. Ford's tribute to their late chairman. They honoured his memory as a gentleman and a chairman. The clerk (Mr. P. H. Phipps) also remarked that the officers were appreciative of the many acts of kindness extended to all of them by their late chairman during his term of office. Mr. J. St. L. Stallwood, as one of the junior councillors, associated himself with the tributes already paid, and said that when he joined the council he was very much struck by Mr. Sturges' kindliness.